Nicole Brown, MSN, RN, is a nurse educator, doctoral candidate and an Army veteran. She is the proud mother of three and is dedicated to providing positive images of the nursing profession for children and the world. The Adventures of Nurse Nicole is a wonderfully clever and bright series about a nurse with three children who are curious about nursing. The Adventures of Nurse Nicole. 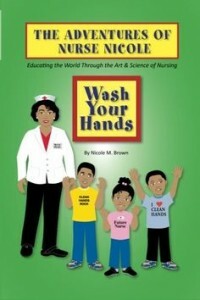 “N is for Nurse” describes the art and science of nursing from A to Z with positive images of the nursing profession. Nursing is one of the most sought after and trusted professions in the world. This is a must-have book, because everyone will need a nurse one day. The next book from The Adventures of Nurse Nicole is titled, “Wash Your Hands,” is a step by step guide to washing your hands. “Wash Your Hands” reviews where germs are located and the importance of washing your hands. Both books are located on Amazon, B&N online and Kindle. © 2017 Pulse Media Group All rights reserved.